Note: This lesson plan was written for the unique socio-political environment of Barcelona in Catalonia in Spain. However, the questions can be adapted for any nationality. Do you think of yourself as Catalan or Spanish? Do you feel a strong connection with the rest of Europe? What does it mean to be Catalan? Or Spanish? Can you be Catalan if you weren’t born in Cataluña? OR if you don´t speak Catalan? 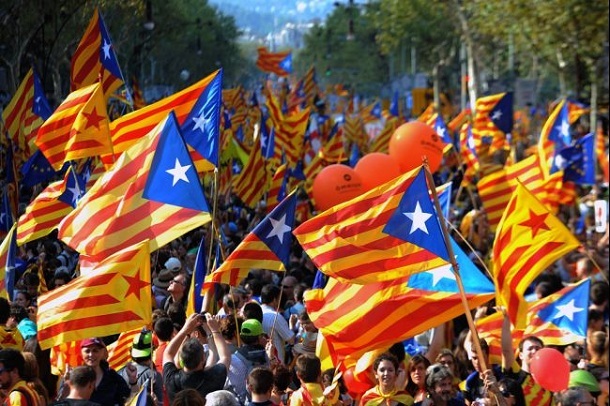 Can you become Catalan by living in Cataluña and absorbing the culture? In groups SS discuss next question in English and write a list with reasons. What are your strongest symbols of national identity? England: Tea, the Royal Family, fish and chips, bad weather, self deprecation, Shakespeare, dark humour, The Battle of Hastings in 1066, Henry VIII. Write Catalan symbols on the board. Why are these so important? What do they symbolise? Which are most important? What happens if a person from outside the EU comes to Spain and wants to get citizenship? What do they have to do? Do they have to take a citizenship exam? Put the questions on the board or copy and paste them and hand them out. Correct answer are in bold. Ask student’s to guess the score Tim (me, a 29-year-old British native) got when he did the test, out of 24. I scored 13 out of 24 so I failed and if I were an immigrant from a country outside the EU I would not be given citizenship. Do you think these are the most relevant (pertinent) questions? What should people know about a country to be a citizen? Tell students that the citizenship test has been changed because of complaints about the relevance of the questions. Here is a link to download a section of the new UK citizenship test. Depending on the level you can actually have the students answer the questions, or do it as a whole class quiz in teams. The test includes some interesting historical information (if your students are into that sort of thing) if not you can just ask a few of the questions to give the students an idea of what they’re like. Students write their own citizenship tests for the teacher. What I want you to do in your groups is write a short Catalan or Spanish citizenship test. 5 questions which you think are the most important and which would help with integration. Cultural, political, history, economic questions etc. You can discuss them, in English and obviously you have to write them in English. You then have to explain why they are important and we will try and make a Catalan Citizenship test. The teacher can help with the question structures but can’t know the answers because at the end he / she will try to complete the test and get over 75%. Do you agree with the idea of citizenship tests? Do you think it´s easy to integrate into a new country or culture? Put challenges on board and students discuss them. Do you think Cataluña is well integrated? If not how can we change this? Previous Post Informal letter to practice to be used to and to get used to.